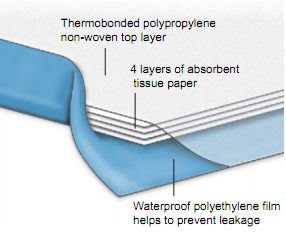 This absorbent underpad provides waterproof protection for beds and chairs. 4 layer tissue filling: Fast wicking action. Keeps patient drier, which may help to prevent skin irritation. Pad remains flat while retaining fluids: Fluid is well-distributed throughout the pad and pad will not bulk up. These pads are great. I haven't had to wash the sheets because of an accident since I started using them.t. Great absorption. The pads hold a lot of ,liquid.